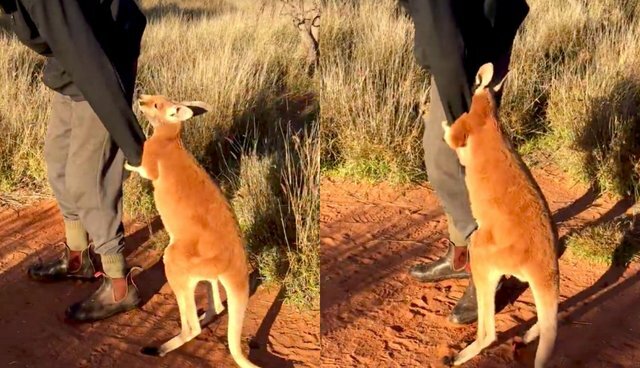 For one young kangaroo, left without a mother like many others at The Kangaroo Sanctuary Alice Springs in Australia, he's found the next best thing - a dedicated dad to love and care for him endlessly. Chris "Brolga" Barns, the founder of the sanctuary, has been caring for the orphaned kangaroo, Johanssen, for about seven months now. In a recent video shared on Facebook, Brolga shows just how much Johanssen has come to depend on his "dad" for affection - and just how unwilling he is to let go whenever it comes time for them to part. In the video, while Barns walks down a dirt road, Johanssen remains close behind, going so far as to raise his hands and wrap them around Barns, as if urging his caretaker to stay with him instead of leaving. "I'll come back, I promise," Barns says in the video. "Little Johanssen doesn't want me to go," Barns wrote about the video. "So I make sure he always gets lots of cuddles." Apparently such behavior is the norm for Johanssen. In another video shared a month ago, Barns points out how impatient the little kangaroo gets when it comes to getting a sip of warm milk, in comparison to his more patient kangaroo friend, Scarlett. Thanks to Barns, Johanssen gets to live his best life as an orphan - pampered and with a great stretch of the Australian Outback to roam as he grows older and more independent.